Unhealthy eating habits refer to failure in fulfilling the eating patterns that the body requires., Unhealthy eating habits may contribute to obesity., There are five major obesogenic factors influencing overweight among Asian children and youth [Table 1]. This study primarily described the children and youth's unhealthy eating habits related to their weight status. The study also looks on the relationship of these factors to children and youth's unhealthy eating habits [Figure 1]. Obesity and Overweight. World Health Organization. World Health Organization. Available from: http://www.who.int/mediacentre/factsheets/fs311/en/. [Last accessed on 2018 Apr 15]. Abuzaid O. Eating Patterns and Physical Activity Characteristics among Urban and Rural Students in Saudi Arabia. Nutrition & Health Sciences Dissertation & Theses; 2012. Kawalek A, Pawlas K. Environmental risk factors contributing to childhood overweight and obesity. Medycyna Środowiskowa Environ Med 2017;20:7-12. Longo-Silva G, Menezes RC, Souza CA, Marinho PD, Toloni MH, Oliveira MA. Factors associated with regular consumption of obesogenic foods: National school-based student health survey, 2012. Revista de Nutrição 2016;29:609-33. Timmermans J, Dijkstra C, Kamphuis C, Huitink M, van der Zee E, Poelman M, et al. 'Obesogenic' school food environments? An urban case study in the Netherlands. Int J Environ Res Public Health 2018;15. pii: E619. Naidu BM, Mahmud SZ, Ambak R, Sallehuddin SM, Mutalip HA, Saari R, et al. Overweight among primary school-age children in Malaysia. Asia Pac J Clin Nutr 2013;22:408-15. Ramachandran A, Snehalatha C. Rising burden of obesity in Asia. J Obes 2010;2010:1-8. Reed M. What is an Unhealthy Diet? LIVESTRONG.COM. Leaf Group; 2017. Available from: https://www.livestrong.com/article/408469-what-is-an-unhealthy-diet/. [Last accessed on 2018 Jul 05]. Hopkins S. Signs of Unhealthy Eating Habits. Available from: http://www.home-remedies-for-you.com/articles/1181/diet/signs-of-unhealthy-eating.html. [Last accessed on 2016 Aug 15]. Louthrenoo O, Charoenarp A, Kittisakmo K. Overweight/obesity, eating behaviors and behavioral problems among school-age children. Asian J Clin Nutr 2016;9:30-6. Park BY, Seo J, Park H. Functional brain networks associated with eating behaviors in obesity. Sci Rep 2016;6:23891. Li B, Adab P, Cheng KK. Family and neighborhood correlates of overweight and obesogenic behaviors among Chinese children. Int J Behav Med 2014;21:700-9. Rachmi CN, Li M, Alison Baur L. Overweight and obesity in Indonesia: Prevalence and risk factors-a literature review. Public Health 2017;147:20-9. Tung HJ, Yeh MC. Parenting style and child-feeding behaviour in predicting childrens weight status change in Taiwan. Public Health Nutr 2013;17:970-8. Kubota M, Nagai A. 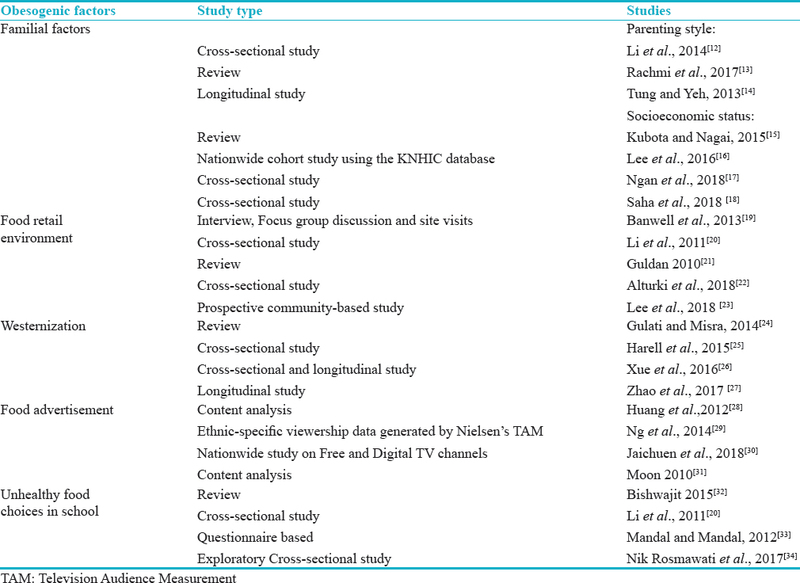 Factors associated with childhood obesity in Asian countries: A review of recent literature. Recent Advances in Obesity in Children [Internet].2015;12:16. Available from: https://pdfs.semanticscholar.org/7f4d/612e650033ade0af0e8baefb6f0aedbaf650.pdf. [Last cited on 2016 Jul 17]. Lee I, Bang KS, Moon H, Kim J. Comparison of obesity rates in early childhood (4 to 80 months) by parental socioeconomic status using national cohort dataset in Korea. Asian Nurs Res (Korean Soc Nurs Sci) 2016;10:305-11. Ngan HT, Tuyen LD, Phu PV, Nambiar S. Childhood overweight and obesity amongst primary school children in Hai Phong city, Vietnam. Asia Pac J Clin Nutr 2018;27:399-405. Saha M, Adhikary DK, Parvin I, Sharma YR, Akhter F, Majumder M, et al. Obesity and its risk factors of among school children in Sylhet, Bangladesh. J Nepal Health Res Counc 2018;16:205-8. Banwell C, Dixon J, Seubsman SA, Pangsap S, Kelly M, Sleigh A. Evolving food retail environments in Thailand and implications for the health and nutrition transition. Public Health Nutr 2013;16:608-15. Li M, Dibley MJ, Yan H. School environment factors were associated with BMI among adolescents in Xi'an city, China. BMC Public Health 2011;11:792. Guldan GS. Asian children's obesogenic diets-time to change this part of the energy balance equation? Res Sports Med 2010;18:5-15. Alturki HA, Brookes DS, Davies PS. Comparative evidence of the consumption from fast-food restaurants between normal-weight and obese Saudi schoolchildren. Public Health Nutr 2018;21:2280-90. Lee EY, Kang B, Yang Y, Yang HK, Kim HS, Lim SY, et al. Study time after school and habitual eating are associated with risk for obesity among overweight Korean children: A Prospective study. Obes Facts 2018;11:46-55. Gulati S, Misra A. Sugar intake, obesity, and diabetes in India. Nutrients 2014;6:5955-74. 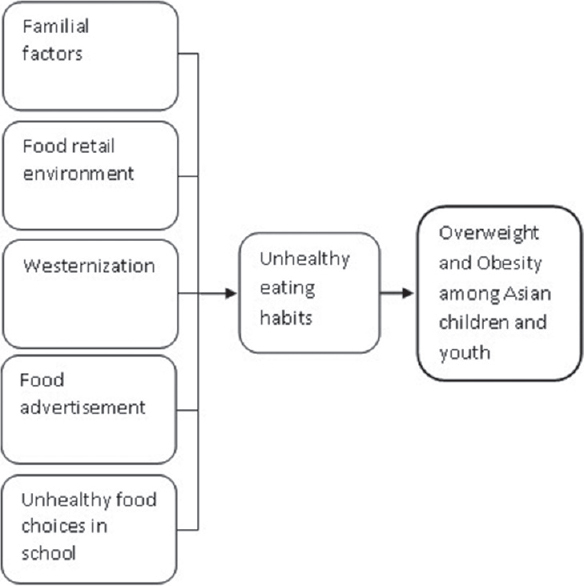 Harell M, Ussery M, Cramer, B, Sharma, M, Arora, M. The influence of “westernization” on nutrition and physical activity behaviors of adolescents in New Delhi, India: Are we exporting an epidemic of obesity? J Appl Res Child 2015;6:10. Xue H, Wu Y, Wang X, Wang Y. Time trends in fast food consumption and its association with obesity among children in China. PLoS One 2016;11:e0151141. Zhao Y, Wang L, Xue H, Wang H, Wang Y. Fast food consumption and its associations with obesity and hypertension among children: Results from the baseline data of the childhood obesity study in China Mega-cities. BMC Public Health 2017;17:933. Huang L, Mehta K, Wong ML. Television food advertising in Singapore: The nature and extent of children's exposure. Health Promot Int 2012;27:187-96. Ng SH, Kelly B, Se CH, Chinna K, Sameeha MJ, Krishnasamy S, et al. Obesogenic television food advertising to children in Malaysia: Sociocultural variations. Glob Health Action 2014;7:25169. Jaichuen N, Vandevijvere S, Kelly B, Vongmongkol V, Phulkerd S, Tangcharoensathien V, et al. Unhealthy food and non-alcoholic beverage advertising on children's, youth and family free-to-air and digital television programmes in Thailand. BMC Public Health 2018;18:737. Moon YS. How food ads communicate 'health' with children: A content analysis of Korean television commercials. Asian J Commun 2010;20:456-76. Mandal A, Mandal G. Prevalence of overweight and obesity among the urban adolescent English medium school girls of Kolkata, India. Ital J Public Health 2012;9:3. Nik Rosmawati NH, Wan Manan WM, Noor Izani NJ, Nik Nurain NH, Razlina AR. How healthy is competitive food served at primary school canteen in Malaysia? Int Med J 2017;24:44-7.